Question 1: What are electrovalent or Ionic compounds? Answer: The compounds formed by the transfer of electrons from a metal to a non-metal are known as electrovalent or Ionic compounds. For example, NaCl is an electrovalent compound. Question 2: What is the reason for difference in reactivity of metals? Answer: Metals are those elements which can loose electrons easily. The reactivity of a metal will depend upon how easily the metal can loose electron and form positively charged ion. Hence, we find some metals are less reactive whereas other metals are more reactive. (Hydrogen and Helium have one and two electrons respectively but still they are non-metals because they cannot loose electrons easily). Question 3: Why do we find most of the ores in oxide form? Answer: The earth's crust is the major source of ores. Most of the ores of metals are found as oxides because oxygen is a very reactive element and is highly abundant on the earth. Question 4: What are metalloids? Answer: Metalloids are those elements which have characteristics properties of both metals and non-metals, e.g., Germanium, Silicon, Tellurium, Antimony and Arsenic. Question 5: Name any one metal which reacts neither with cold water nor with hot water but reacts with heated steam to produce hydrogen gas. Question 6: Name two metals which are both ductile and malleable. Question 7: A green layer is gradually formed on a copper plate exposed to air for a week in a bathroom. What is this green substance? Answer: The green layer is formed due to the formation of basic copper carbonate. [CuCO3.Cu (OH)2]. Question 8: Why Tungsten metal is selected for making filaments of bulbs? Answer: It is because Tungsten has very high melting point and high resistivity. Question 9: Name any two neutral oxides. Answer: Nitrogen Monoxide (NO) and Carbon Monoxide (CO). Question 10: Name the elements present in these alloys. (i) Stainless Steel = Iron + Chromium + Nickel. (ii) Bronze = Copper + Tin. (iii) Brass = Copper + Zinc. (iv) Duralumin = Aluminium + Copper. (v) German Silver = Copper + Zinc + Nickel. (ii) For making windows and door-fittings. (iii) For making aircrafts and kitchen-wares. (iv) For making equipment for feed and dairy industry. (a) Metals are regarded as electropositive elements. (b) Zirconium is known as a strategic metal. (c) Reaction of nitric acid (HNO3) with metals generally does not evolve hydrogen gas. (d) Carbon is not used for making aluminium from aluminium oxide. Answer: (a) Metals are regarded as electropositive elements because it can loose electrons easily to form positive ions. Answer: (b) Zirconium is a valuable heavy mineral which is used in atomic power plants, nuclear reactor etc. Hence, it is called a strategic metal. Answer: (c) It is because nitric acid (HNO3) is a good oxidising agent and so it oxidises H2 to H2O. Answer: (d) Because aluminium is stronger reducing agent than carbon and hence, carbon cannot be used for the extraction of aluminium. 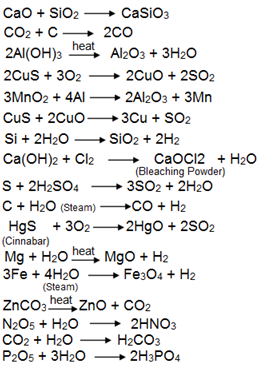 Question 13: Explain how the following metals are obtained from their compound by the reduction process. (a) metal, which is low in reactivity series. (b) metal, which is middle in the reactivity series. (c) metal, which is highly reactive. (a) Metals of low reactivity series can be obtained by reduction using cake. (b) Metal which are intermediate in the reactivity series can be obtained by reduction using Al. (c) Metal which are highly reactive can be obtained by electrolytic reduction. Question 14: How will you show that silver is less reactive than copper? But silver cannot displace copper from copper nitrate, hence, silver is less reactive than copper. Question 15: What is magnetic separation? Name two ores which are concentrated by using this method? Pyrolusite (MnO2) and Magnetite (Fe3O4). Question 16: How will you show by an activity that copper is more reactive than silver? Question 17: Define a chemical bond. Answer: The attractive force which holds together two atoms, two molecules, two ions or a combination of these is known as a chemical bond. Question 18: What is reactivity series of metals? Answer: Reactivity or Activity Series is a list of common metals which have been arranged in order of their decreasing reactivity. Question 19: What is metallic lustre? Answer: Metals, in their pure state, have a shining surface. This property is called as ‘metallic lustre’. Why elements cannot be grouped according to their physical properties alone? 1. All metals except mercury exist as solids at room temperature. 2. Although metals have high melting points, there are exceptions like - gallium and caesium which have very low melting points. 3. Iodine is a non-metal but it is lustrous. 4. Carbon is a non-metal that can exist in many forms. 5. Metals are generally very hard or rigid but alkali metals (lithium, sodium, potassium) are so soft that they can be cut with a knife. 1. Allotrope: Allotropes are the elements which exist in two or more different forms in the same physical state. Allotropes generally differ in physical properties and may also differ in chemical activity. Diamond, graphite and fullerenes are three allotropes of the element carbon. 2. Amphoteric Oxide: Metal oxides are basic in nature. But some metal oxides show both basic and acidic natures such as - aluminium oxide, zinc oxide, etc. Such metal oxides which react with both acids and bases to produce salts and water are known as amphoteric oxides. Question 22: What is Inert Gas or Noble Gas? Answer: An inert gas or noble gas is a gas that has extremely low reactivity with other substances. The noble gases for example - helium, argon, neon, xenon, krypton, radon, and element 118 (Uuo) exist in their elemental form. Noble or inert gases have a completely filled valance sheel and hence, show little chemical activity. Question 23: Most of the ores are found in oxide form. Why? Answer: Ores are found in the earth’s crust mainly as oxides then as sulphides or carbonates. This is because oxygen is a very reactive element and is very abundant on the earth. Question 24: What is “Thermit Reaction”? Answer: A Thermit Reaction is basically iron oxide (ferric oxide) reacting with aluminum to produce molten iron. This is an exothermic reaction. Iron obtained in this process is in molten state. Thermit reaction is used for the welding of rails or cracked machine parts and the process is called as Thermite welding. Question 25: Name the most widely used method for refining of metals? 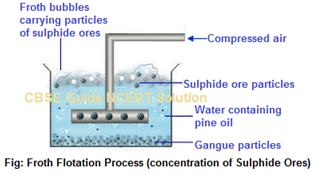 Answer: The metals produced by various ore reduction processes are not pure. They contain impurities, which must be removed to obtain pure metals. The most widely used method for refining of metals is Electrolytic Refining.